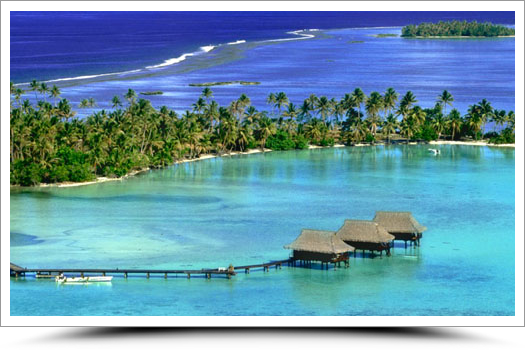 Le Taha’a Island Resort & Spa is a 5-star property, located on a “motu” islet, a 35-minute navigation from the Raiatea Airport and a 5-minute boat ride from the village of Tapuamu on the main island of Taha’a. The ultimate way to connect between Taha’a and Bora is definitely by helicopter! Beyond being an easy and quick transfer, this 14-minute flight will be an excursion of pure beauty as you fly above the stunningly gorgeous Tahitian lagoons. The Owners’ wish was to keep the resort as natural and as green as possible. The whole resort was built around the existing vegetation. You will discover beautiful old trees, colorful flowers and plants, something quite unusual on a “motu”, thanks to the use of seaweed as fertilizers. 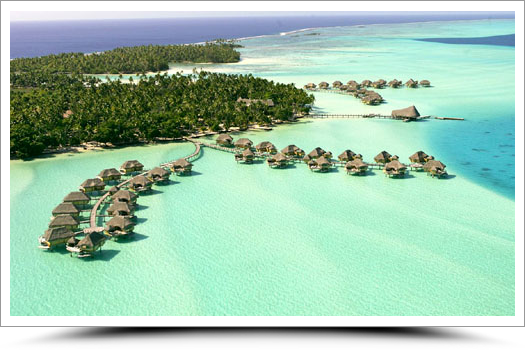 This is THE Resort in Tahiti. If you are looking for the best, look no further and keep your eyes open for the stars you may be sharing the lagooon with! This Tahiti hotel in TAHAA is located in a paradise-like setting on the Motu Tu Vahine (Island of the Woman), a private little island of 23 acres, in the middle of the lagoon of Tahaa. The Vahine Island, Private Island Resort has everything to make your stay in paradise an unforgettable one. White sand beaches, a magnificent coconut grove full of light and shadows, a coral garden full of underwater splendours, a full range of blue hues splashed across the lagoon, and a backdrop of superb sunsets over Bora Bora will take your breath away and remain forever etched in your memories of this unbelievable place. Vahine Island is one of those exceptional spots that steps outside of time, unique and spellbinding, where calm and sensuality harmonize with charm and serenity. Ideally located on a small private motu just minutes from the main island of Tahaa and its riches, this 3* standard Boutique Hotel is an invitation to exoticism: shallow crystal clear lagoon for kilometers, breathtaking sunsets over Bora Bora, within walking healthy reef… Its 4 large beach suites (only! ), all facing Bora Bora, are very pleasant to live with their king size bed, jacuzzi on the terrace, TV, air conditioning, living room and large bathroom. The all Polynesian staff at this resort, and boutique nature give guests an authentic Polynesian experience not found at some of the larger 5 star resorts around the islands.